Morocco Journal & Life Design Adventure with Kendall Dudley, October 8 - 19, 2014. Are you seeking a creative adventure? Read on to learn more about this Morocco experience and how to journal your way to a new you. This trip is for anyone in transition or between chapters in work, love, place or purpose who is seeking a means to awaken the senses and discover a creative structure for life exploration. Set against the beauty and exoticism of Morocco, you will learn to pave a personal and powerful path to discovery by revealing what intrigues you, what disturbs you, what delights you and what is newly emerging within you. The trip begins in Marrakech and after days in the old and new city, heads to the desert, mountain gorges, villages and Kasbahs, traveling the lunar landscape of Ait Ben Haddou (a UNESCO World Heritage architectural site) and returning along the Atlas Mountains to Marrakech and its conundrum of fortune tellers, actors and musicians. There is a group activity scheduled each day, but participants are welcome to spend time on their own to write, paint, meander and reflect in groups and alone. Each morning starts with journaling and a set of questions to consider for the day. In the evening, participants contribute entries to a common journal while noting the differences in one another’s experience of the day. 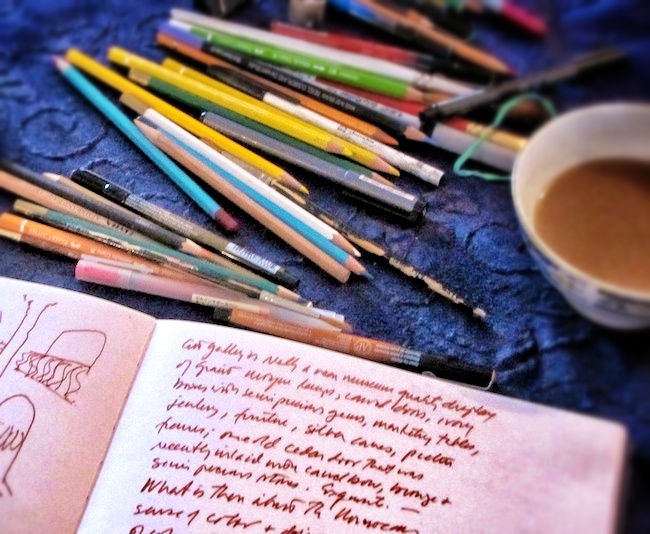 Journaling focuses on being in the moment and includes creative dialogues, list-making, simple art techniques and micro life stories. More adventure than relaxing vacation, guests stay in restored ryads and eat at excellent restaurants populated by locals. Limited to a maximum of 15 guests, the group’s route and accommodations are provided by trusted tour professional, planner and guide, Addi Ouadderrou, a Moroccan who runs trips of his own in Morocco. October 8-19, 2014 (12 days). $2,700 USD double occupancy. Single supplement available. For additional information and booking, visit www.writeyourvividjourney.com. 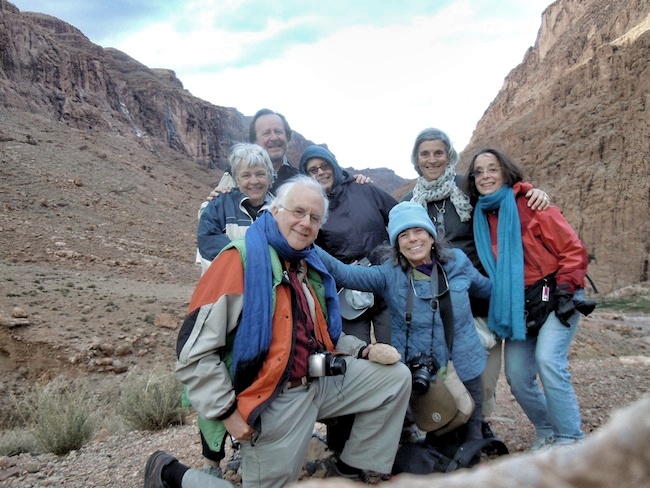 Trip leader Kendall Dudley and 2013 Workshop Participants in Morocco.